Art doesn’t need to live in museums or galleries. It can live on the cover of scientific journals, educating the masses in creative ways. That’s where climate change artist Jillian Pelto’s latest artwork is going, at least. 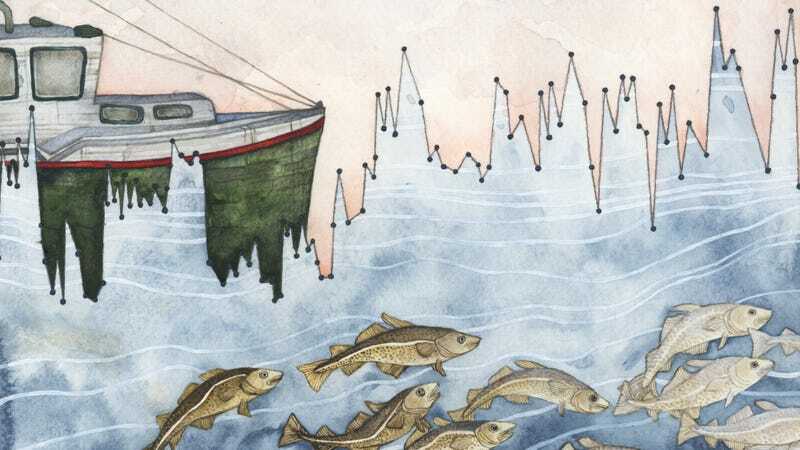 A science graduate student at the University of Maine, Pelto creates beautiful watercolor pieces to help communicate scientific data in ways that are far more eye-catching than a simple graph. Her pieces typically involve conveying information on melting glaciers or threatened species. Her latest, “Gulf of Maine Temperature Variability,” uses oceanic imagery to tell a tale of how temperature swings in this Atlantic continental shelf basin home to endangered species and migratory birds are becoming more dramatic, and hints at the consequences that could have for the entire ecosystem. The University of Maine’s new journal of conservation and sustainability, Spire, will feature it on the cover of its latest issue publishing this week. This piece is based on research published in 2015 led by David Townsend, who’s with the university’s School of Marine Sciences. The team speculates the recent increase in temperature variability results from more freshwater entering the Gulf due to melting in the Arctic. As this colder water flows in, it messes with both the temperature and the mix of nutrients in the Gulf, impacting biological processes. Pelto attempts to portray this through strokes of blue and grays. The artwork also has a message about a more direct impact of human activity, with the swimming cod slowly losing color from left to right. “It’s subtle, but their color fades away across the page,” she said. “That’s because they’ve been overfished. These changes have ripple effects on the entire ecosystem, affecting other organisms indirectly, like the shrimp and lobsters depicted in the piece. “I included the boat, as well, to make sure people notice this is a human impact that’s causing these stresses,” Pelto went on. Her message is loud and clear: We’re making this mess.